This screen capture shows a Steak 'n Shake restaurant in Upper Macungie Township. A new, highly anticipated Steak 'n Shake opened in Warminster, Bucks County, on Thursday, Jan. 17, 2019. The next day it was damaged by a fire and closed for indefinitely..
On Thursday morning, a brand new Steak ’n Shake opened its doors in Warminster. By Friday afternoon, it was closed indefinitely because of a fire. The restaurant’s Facebook page broke the news of the fire on Friday around 2:30 p.m., thanking customers who’d managed to visit during its roughly 14 total hours of operation for showing their support. Warminster Township Manager Gregg Schuster said that there were no injuries in the fire, and that the restaurant would be closed for “some time” to deal with the damage. According to those who visited or passed by the restaurant during its grand opening Thursday, a line of cars stretched down Street Road in the Bucks County town. 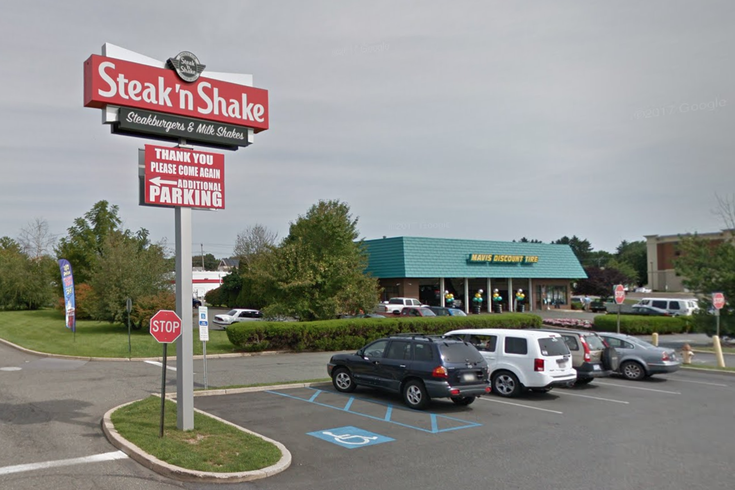 The closest Steak ’n Shake in the Philadelphia area is in Norristown; outside of that location, there’s one in Bethlehem Township, one in Upper Macungie Township, and one in Middletown. One Facebook commenter said her daughter “broke into tears” when she was told about the fire. Demand for the Midwestern fast food burger joint was apparently high in Warminster, and now the wait will be even longer.